A New York-based consortium, led by SUNY Polytechnic, RIT and the University of Rochester, has been awarded a multimillion-dollar federal investment to create a national photonics center. 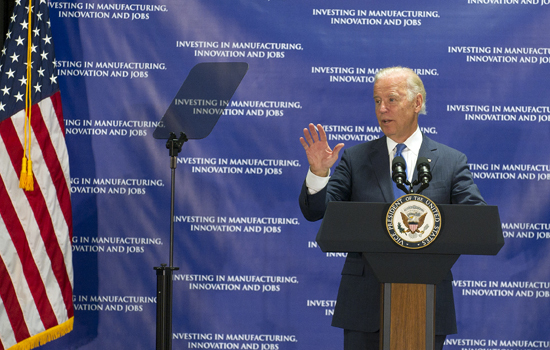 The award, issued under the federal government’s National Network for Manufacturing Innovation (NNMI), was announced today by Vice President Joe Biden and New York Gov. Andrew Cuomo at a news conference at a SUNY Polytechnic facility at Canal Ponds in Greece. A New York-based consortium, led by SUNY Polytechnic, Rochester Institute of Technology and the University of Rochester, has been awarded a multimillion-dollar federal investment to create a national photonics center. The award, issued under the federal government’s National Network for Manufacturing Innovation (NNMI), was announced today by Vice President Joe Biden and New York Gov. Andrew Cuomo at a news conference at a SUNY Polytechnic facility at Canal Ponds in Greece, a suburb of Rochester. The new institute will be called AIM, short for American Institute for Manufacturing Integrated Photonics. The consortium, which also includes Massachusetts Institute of Technology, University of Arizona, University of California at Santa Barbara and other academic and industrial partners, including Alfred and Columbia universities, was chosen over two other proposals that had also advanced to a final round in a U.S. Department of Defense program to establish a National Institute of Photonics. Championing the New York application, submitted on behalf of the consortium by the Research Foundation of the State University of New York, were Senators Charles Schumer and Kirsten Gillibrand and Congresswoman Louise Slaughter. The federal government has pledged $110 million for the new national institute and New York state has pledged $250 million. Ryne Raffaelle, RIT vice president for research and associate provost, said advanced developments in integrated photonics are essential to the nation’s manufacturing capabilities in such areas as high-speed data and telecommunications. He said technologies developed at this national center would allow for more information to be transmitted far more efficiently. Raffaelle said RIT is expected to support the institute’s work through workforce development, including short continuing education courses that use the university’s laboratories as well as its undergraduate and graduate programs, including a bachelor’s and master’s programs in microelectronic engineering, master’s programs in manufacturing and mechanical systems integration, telecommunications engineering technology, electrical engineering, computer engineering and imaging sciences, as well as its Ph.D. in microsystems engineering. This is the second major designation of this type for the region. In 2014, RIT was named a core partner in the Chicago-based Digital Manufacturing and Design Innovation Institute and is slated for an investment of up to $20 million. RIT has contributed to advances in the design, fabrication and manufacturing of electronic and photonic devices for more than 30 years as technology generations have progressed from the micron-scale to the nano-scale. The microelectronics program, created in 1982, was the nation’s first Bachelor of Science program specializing in the fabrication of semiconductor devices and integrated circuits. The microsystems engineering Ph.D. program began in RIT’s Kate Gleason College of Engineering in 2002. The university’s first doctoral program was imaging science in 1990, the first of its kind in the nation. More than 2,000 RIT engineers have been placed into related engineering positions across New York State and throughout the U.S., Europe and Asia.